Sure, the three of us spend a lot of our time digging up treasures for all of you to enjoy, but we also have some favorite vintage pieces of our own -- they're hung in our closets, decorating our homes, piling up on our bookshelves and mixed in amongst our record collections. And every now and then, we can't help but show them off. 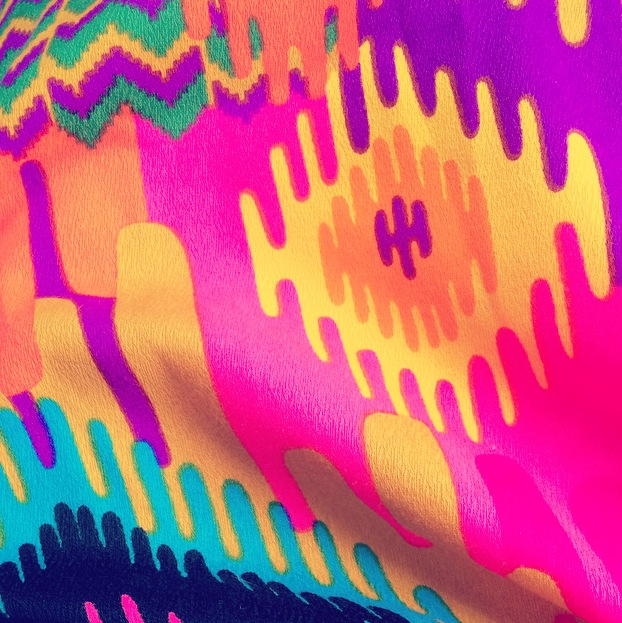 My most recent discovery and current favorite vintage garment is this 70's handmade, psychedelic, melting god's eye patterned skirt. It reminds me of the work of a current painter named Oliver Hibert. I was out searching for a Halloween costume for my Fear and Loathing in Las Vegas ensemble when I came across this handmade treasure at the Goodwill marketed with the other costumes as a "hippy outfit". It was actually a two piece with a long sleeve ruffle top that would never fit me. But I was just able to squeeze into the skirt and made a tiny alteration so it would fit more comfortably. Its one of those pieces that I won't wear everyday but enjoy staring at it in my closet and have plenty of neutrals to pair it with. The belt pictured is one of my favorite staples. It has a hook on the back of the buckle that attaches to the braided belt at any size and the mixed metal gives it a lot of range. It is genuine leather made in Morocco. My favorite vintage to hunt for is jewelry. Vintage accessories were made with such care and precision. I buy jewelry that feels like tiny pieces of art I can spend the day with. I'm all about the aesthetics not the price. The two pieces out of my collection that I feel are most representative of my current style were gifted to me but also happen to be vintage. It feels good to wear those pieces together to show off my personal style and the ladies who shaped who I am. This gold bracelet was one of my late grandmother's staple pieces. I love the subtle 80's bling! She had great taste and wasn't afraid to be bold and be herself. My mom got me this long geode necklace for my birthday. I love the organic details and shape and that it isn't perfect.